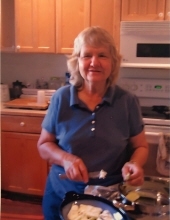 Martha R. Murphy, age 82, of Mercersburg, PA, had a very peaceful passing at her home on Thursday, January 24, 2019, with her family by her side. She was born on Friday, January 8, 1937, in Staten Island, NY , the daughter of the late Alvin and the late Alice ( Sandsmark) Tye. Martha was married to the Pastor Larry R. Murphy of Mercersburg, PA for 60 years. She was a Pastor and a teacher. She played the piano and several other instruments. Martha and her husband worked with the hearing impaired and blind before moving to the area 40 years ago. Together, Martha and Larry started the New Life Christian Centre and New Life Christian Academy and the Feed My People Food Bank; of which the School and Food Bank are now closed. These organizations were Martha's life. She loved God and her family. She was a very giving person. Martha is survived by her husband Pastor Larry R. Murphy, 4 children, Debra R. Mason, Larry P. Murphy, Pastor James A. Murphy and Pastor Richard L. Murphy, 16 grandchildren and 19 great grandchildren. She is also survived by one sister Evelyn Smith and one brother Pastor Paul Tye. Martha is preceded in death by her parents and one sister. A memorial service will be held on Sunday, February 10, 2019, at 2:00 PM at the Mercersburg Mennonite Church, 10060 Buchanan Trail West, Mercersburg, PA 17236. In lieu of flowers, memorial contributions may be made to New Life Christian Centre, 8802 Buchanan Trail West, Mercersburg, PA 17236 in Martha's memory. The money will be sent to Kenya to help a missionary with education for several children for the year. The family has entrusted Martha's care to Kelso-Cornelius Funeral Home in McConnellsburg, PA. Online condolences may be expressed at www.kelso-corneliusfuneralhome.com. To send flowers or a remembrance gift to the family of Martha R. Murphy, please visit our Tribute Store. "Email Address" would like to share the life celebration of Martha R. Murphy. Click on the "link" to go to share a favorite memory or leave a condolence message for the family.